YES WE HAVE MUDEYE'S SO BE QUICK PUT YOUR ORDER IN NOW BEFORE THEY GO!!! Fly fishing has picked up in the last few weeks with some good results coming from Anglers Reach, Braemer Bay, Buckenderra and Seven gates. After all the rain we have had things are Improving out wide and in close with rainbows and browns most fishers are using large wet flies out in the deeper waters and in close the nymphs seem to be doing the job on the browns out in the deeper waters big woolly buggers and fuzzy’s and yabbie flies are working well at a really slow retrieve. If you are walking the edge look for the gully’s use a bead head flie let it drop retrieve slow the fish are there with all the rain there is plenty of food laying around. Overall the fishing is picking up the lake is rising and the weather is looking good. Remember the better fishing days are the bad days so do not let the weather put you off. Jindabyne is fishing really well with good results coming from most parts of the lake, this is the time to start walking and looking for the big browns now they have finished spawning. Overall jindy is fishing well fish are in close and moving around looking for food unlike eucumbene fish jindy on a nice sunny day sun behind your back and keep moving look for them do not stand around waiting go to them!! Howdy Michael, Peter at Braemar with a fishing report ending week Sept 25th 2016. Generally the fishig was a bit quiet at Braemar compared to previous weeks, the Level continues to rise and has now reached the carpet grass which should have fired up the bait fishing consierably but this was not the case, catches were few and far between in all categories, but bait still remains the most reliable method. The Dodsworth gang managed a nice rainbow on worms late afternoon but it was there only catch in 4 outings across the past weekend, Peter Hays first visit to Braemar proved successful though with 3 nice rainbows and Brown all caught fly fishing in Jox Cove, Peter used a variety of flies but had most success with a shortned olive woolly bugger, Ben Tickle caught a great Bown at the beginning of the week using his verson of a olive woolly bugger in breezy conditions. Constantine and Tarek caught 3 Browns trolling near Halstrom Island on Tassie # 106 and # 110 also in breezy conditions, those fish were caught mid morning but they report no action either side of that 8 hour sortie, Jim Mason and David Page trolled for 2 days without one hit which was very disappointing for them indeed and Owen Clarke from Newcastle also had a lean time catching only 1 Brown from 3 outings, that fish took a # 48 Tassie. Daryl Suckley and Max Gengalacki also suffered with lean pickings from their outings with the occassional Rainbow to 800gms from daily visits using powerbait and worms, fish of the week went to young Brock De Paoli from Melbourne who managed a great looking 2006 gms Brown whilst lure casting along the clay banks near the spillway, Brock used a variety of lures but caught his Brown on a Laser Pegron which are proving deadly at the moment. Once again Braemar are running speacial deals on accommodation packages for the Snowy Mountains Trout Festival this year between October 29th and November 5th, the 2 “10 bed” houses are avilable as are 2 “3 bed” cabins, so get in quick before they go as well, Braemar also has the full current range of Tassie Devils and some discontinued ones as well and remember to call into the Alpine Angler on your way through for up to date info on conditions and a selection of live bait. Pictured are the Dodsworth gang with their fine Rainbow, the great Brown Ben Tickle caught using his own wooly bugger and a fine Rainbow caught by Peter Hays on Sunday. Again thing are looking good rainbows and browns are going well so both lakes are worth looking at, With the lures much the same as Jindabyne but you must try the new King Cobras not bad!! Spotted Dog Rapala’s are going well as always. Overall the trolling is going well the weather is great the fishing is great but the reports have been better when the weather is not so good as always. Thing are going really well after all that rain the lakes are rising and the fish are active best bait at the moment are worms and power bait. 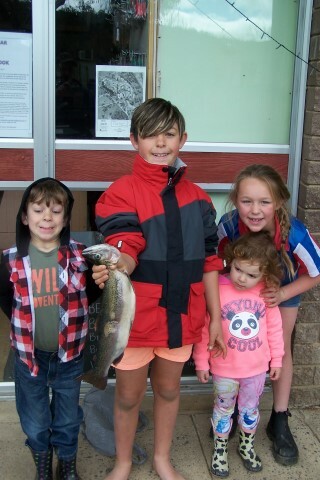 Over at jindabyne most areas are fishing well both browns and rainbows are going well on both worms and power bait. Best areas are Waste point, kalkite, East Jindy, Poo bay and all over the western side of jindy. Eucumbene thing are getting better and better worms seem to be the bait at the moment with plenty of rainbows and browns coming in. Power bait is working ok but the worms are kicking ???. Remember the season is about to start and the weather is warming up if you are going to camp around the lakes we need your help lets keep the lake free from rubbish this year if you see anyone doing the wrong thing and leaving rubbish behind “ DOB THE TOSSERS IN “ Let's fix this problem before we lose it.